There’s nothing more frustrating than hearing that the manufacturing equipment in your plant isn’t operating properly because it wasn’t installed on a solid foundation. While some foundations move by design, most projects require a base that won’t shift or flex over time. The reality is that not just anyone can install your machine. You need to hire a reputable industrial general contractor who has experience not only assembling equipment, but more importantly, designing solid foundations. Neglecting to create an infrastructure that will properly support the machine over time can lead to misalignment, expensive repairs and raise safety concerns. 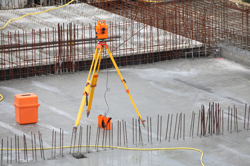 To ensure the job is done correctly the first time, here are three factors structural engineers consider when designing a foundation for equipment installation. The type and size of manufacturing equipment to be installed depicts the size and depth of foundation required for the project. For example, a lightweight machine can be anchored with a six- to eight-inch concrete slab, while heavier, bigger equipment requires digging to bedrock and then coming up to the surface with concrete. Another factor that is taken into account are vibrations, from both the machine to be installed, as well as the adjacent equipment and tools, such as overhead cranes. Many of the machines that AME installs, for example, steel machining equipment, have tolerances that are very tight and the vibrations that other machines put into the ground can have an effect on their calibrations, as well as the foundation in the setting process. Lastly, the soil type and subgrade conditions under the machine are the biggest factors in ensuring manufacturing equipment is installed on a solid foundation. This is what’s supporting the foundation. Foundations are typically designed by a structural engineer and in addition to all of the loading information for the various parts of the machine, they request a soil report. This consists of drilling in where the machine will be setup and taking samples to determine the bearing capacity of the existing soils. While it’s testing is required for every job, it’s particularly important in new plants and certain geographical areas where the soils are not good for bearing capacity. For instance, in the Southeast, there’s an abundance of red clay that’s a good bearing type of material. However, when silty material is encountered, it can bear pressure, but will cause capacity problems with the if there’s water in the ground since it doesn’t hold moisture. Working with an expert contractor who knows how to properly evaluate all three factors before beginning a foundation project can save you numerous headaches down the road. If you have any questions about an upcoming project or need help fixing a faulty foundation, we’re happy to discuss your options!